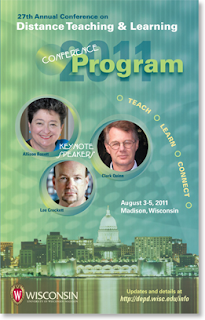 27th Annual Conference on Distance Teaching and Learning- Nicole's Keynote summary and reflections. I have been attending this conference for about 7 years now and I'd say that I always get the most out the wonderful keynotes that present there. This year was no exception. Lee’s presentation started with the overview that as educators it is challenging to keep up with changing technology and the sheer fact of adapting to change. Just when you learn one thing and get comfortable another better and new technology is already knocking at the door. Lee explained Moore’s Law (http://en.wikipedia.org/wiki/Moore%27s_law) which looks at the trends of computer technology history and future change. Basically Moore’s Law shows a pattern of how technologies improve exponentially and then also go down in price. Lee used the personal computer as an example. We can remember how back in the day we could buy a beast of a computer with a whooping 1 megabyte of hard drive for a couple grand! Pretty much every 2 years later the power and space would increase (double) and then price (to make and purchase) would go down twice as well. This pattern currently has been reduced to a 1 year and soon will be on a 6 month schedule. The funny thing about all this is that if Moore’s law is right in just a few years we may be able to purchase a computer that runs on 200 terabytes of RAM and has a 40 terabyte hard drive and may cost only $1.37! It sounds ridiculous but you know if back in 1980 if we asked you if you’d have something like an iphone in your pocket that can do all that it does and that you’d pay about $200 for it we might have been skeptical. Technology is changing (improving!) as fast as lightening. How quick are we to adapt to the change? How quick are institutions when it comes to adopting and adapting to change? Take cell phones for example, they are coming out with better versions of cell phones so fast that by the time we buy one there is a new ‘upgrade’ in just a few months and the one in your hand is outdated. Is your cell phone a smart phone or just a thing in your pocket to make phone calls? Seriously, how long are you going to resist getting a smart phone? Contemplate the reasons why you haven’t. I have heard some people say “I just figured out how to use this darn thing why would I go get another (tech item) and have to figure that out?” My reason was mostly due to cost. Of course now that I've finally made the switch, I don't know how I could have lived without my smartphone. We can apply the same concept of cell phones to education. How many institutions are incorporating mobile technologies with the curriculum? Why might they not be? Certainly could be due to funding especially these days. It might be due to the fear of spending good money on one thing and then finding out the following year it is already outdated. There are a variety of reasons in combination that could be involved. Obviously, we are all conscious of what is going on with change and technology, but the big question is how will this affect how we teach and what we teach? Are we preparing our students for the future and how to adapt to change? The reality of right now, 2011, information is easy to dig up at our finger tips. One key factor is deciphering the credibility of the information and how the info may be leveraged to problem solve. The future will change our priorities now, and with that our thinking processes may change as well. So that means we need to address how we teach and what teach. 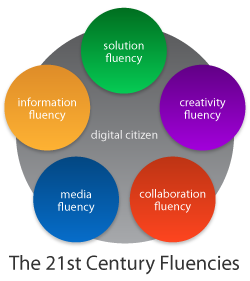 The 21st Century Fluency Project describes the fluencies that are critical for our students to have. Lee’s keynote was much more engaging thought provoking then I described it above. Although I was certainly inspired, I was left with a feeling of urgency and I will admit a little bit of that ‘uncomfortable’ feeling. Sometimes I feel like a little fish swimming against the sea. But when the sardine approach was explained it made me feel much better. When several small fish (leaders of change) swim together (collaborate) it makes it easier! Please explore the 21st Century Fluency Project website (http://www.fluency21.com/) for tons of resources, explanations and suggestions for teaching. Find out how you can become a committed sardine. Biggest demand in the marketplace are creative thinkers and creative problem solvers. The Flynn Effect: IQ scores have been steadily rising but creativity took a steep downfall around 1990 and has been decreasing ever since. Why? What can we do as educators to change that? Technology is not a 21st century skill, it is the literacy of how we may leverage it and use it. Fusion 2011 was held July 2011 in downtown Denver. This was my first D2L conference and how nice that it was held less than 20 minutes from the Regis campus. The Monday morning keynote featured Jonah Lehrer, a rather young-looking scholar with a number of ideas about thinking. Jonah provided examples of how people can dramatically alter results simply by thinking in less obvious ways. He suggested trusting your intuition for rapid decisions. And similar to an inventor experiencing multiple failures before reaching success, he suggested that one needs to be incorrect multiple times before being correct once. Practice makes perfect. Desire2Learn featured several new, or at least newer, products. One is Campus Life, a mobile app. This is a stand-alone product that integrates features such as campus announcements, a campus calendar, and similar with D2L courses including content, discussions, and calendar. It’s an extra cost option that is worth looking into. D2L also featured a recently acquired technology called Capture for lecture captures. Capture was recently purchased and is still being integrated into the D2L fold but appears to have all the basic features of a lecture capture solution including scheduling and streaming. The Tuesday morning keynote featured Natalie Jeremijenko, a social scientist who examines the overlap between social media and the world around us. Although I found her talk quite entertaining, I really can’t summarize what she said. I’ll simply share the title and let your imagination take it from there: The new entertainment system: Why wrestling rhinoceros beetles, texting fish and building swamps is the new black. I was fortunate enough to attend several private sessions with D2L reps including an overview of several mobile technologies. D2L mobile is included in the basic D2L package. Mobile provides basic access to content, discussions, and email to most mobile devices. There are also a number of extra-cost mobile options that show great promise. I’ve already mentioned Campus Life. A project targeting faculty that is still in development will provide downloadable assignments, offline grading that automatically syncs with courses when a signal is available, and on-screen notation. The app primarily targets tablet computers rather than smartphones since I can’t imagine annotating anything on a smartphone. Two other mobile apps mentioned that have real potential are a mobile eportfolio app and mobile analytics. Pretty cool stuff. The Wednesday noon keynote featured Steve Brinder, a K-12 educator and professional stand-up comedian. Steve’s talk was titled “How to survive teaching with a sense of humor” and was really quite funny. Here is a YouTube clip from another talk he did but using similar material. Enjoy. Gary made a great point when he emphasized that students don't have issues when migrating to a new LMS but they do have issues with faculty that aren’t familiar with the new environment and how the tools work. Faculty must do their homework and become familiar with their new classroom. DePaul provided sandbox courses for all pilot faculty. He suggested creating sandboxes as soon as possible. If creating video tutorials, he recommended focusing on one question and making courses functional rather than informational. Don’t tell them what to do but make them actually do the task. DePaul’s D2L training materials are available publically at http://teachingcommons.depaul.edu. Josh graciously allowed permission for their use by emailing fits@depaul.edu.